Let’s face it, biological attacks are the things nightmares are made of. Hollywood has been having a field day coming out with movies based on this vulnerability, ranging from campy zombie movies to the much more scientifically accurate Contagion. Biological attacks are the intentional release of bacteria, viruses, or toxins to disrupt society or kill people. The scale of an attack can range from a single person to putting virtually everyone in the world at risk. Biological weapons are relatively cheap to obtain or manufacture, making them appealing to underfunded terrorist cells or enemy states. They are different from chemical and nuclear attacks in that certain types of biological attacks can be contagious. Some of the more notorious biological weapons include ricin, anthrax, and smallpox (‘exterminated’ diseases are no longer vaccinated). Many attacks of these types would end up manifesting as widespread pandemics. 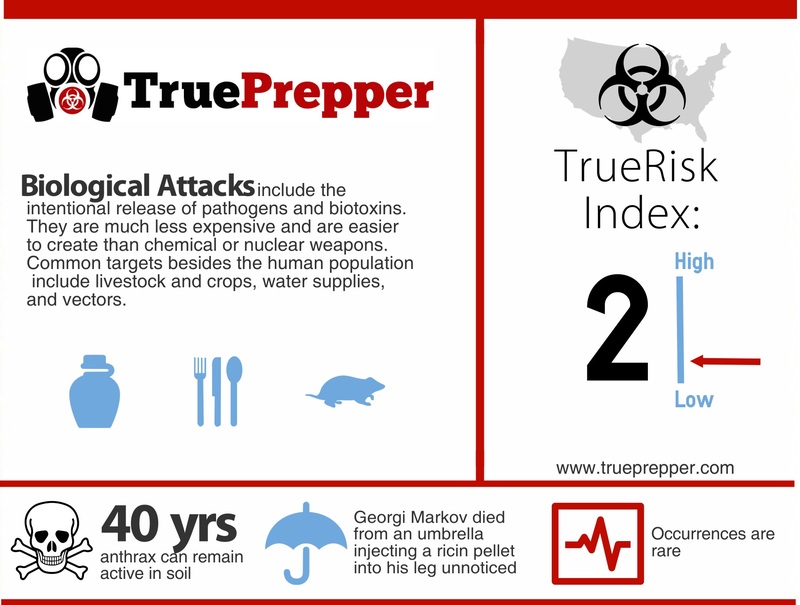 Our TrueRisk index of course includes a section on prepping for pandemics. Any of these attributes drastically worsen a biological weapon’s potential severity. An attack with these markers would most likely end up being a pandemic- the most severe type of biological attack. A biological attack is one of the more well known SHTF scenarios, and it can definitely cause TEOTWAWKI. While there are mitigation plans in place through the CDC, FEMA, DHS, and DoD, (prepper acronyms explained) a biological weapon that contains most or all of the key features mentioned above could easily outspread any existing plan. A biological attack would most likely cause TEOTWAWKI by evolving into a pandemic. A biological attack shows up as a 2 on the TrueRisk index. While an attack could have devastating consequences, they can also be localized and even non-fatal. Mitigation plans are in place to prevent and cut short these attacks. The Strategic National Stockpile (SNS) is a cache of vaccines maintained by the US government for rapid deployment just in case of a biological attack. They also have plans in place to rapidly develop vaccines through resources in the World Health Organization (WHO) and Center for Disease Control and Prevention (CDC). Estimating any increase or decrease to your personal risk level is very easy. Urban areas are much higher risk than rural areas, and suburban is in between. Closer proximity to other people increases the likelihood of being a target in the first place, but also increases chance of infection if the biological attack is communicable. The risk difference between a natural pandemic and targeted biological attack is pretty large. A biological attack is not necessarily a pandemic, meaning it can include attacks with lesser risks. Biological attacks have never manifested into a pandemic before, so it is not historically common either. There are detractors to using pandemic level attacks for the attackers as well, since biological weapons are indiscriminant. The movies in Hollywood never show people getting or being prepared for a biological attack. While biological attacks are very hard to detect until actual symptoms are shown, you can still prepare to encounter them. Personal protective equipment is key for venturing out where you could risk exposure. The best plan is to get away from populated areas and bug in. If you cannot get away, simply bugging in could prove effective. Avoiding contact with others is the best practice. Staying protected during a biological attack requires a good amount of gear. It usually involves hunkering down either at home or your bug out location, which will determine your kits needed. Plenty of food storage and personal protection will be needed. A biological attack may or may not have a warning or prior notice, depending on the vector used to disperse the attack agent. Most of the times there would be no warnings, since groups will choose biological attacks for the ‘surprise factor’ of the attacks. These attacks will strike fear into the very heart of society and cause all sorts of panic. The best thing to do during an attack is to limit your exposure to others. There is not a whole lot of good that can come from coming in contact with other people during a biological attack, and you will want to stay isolated and informed on the situation. Learning the scope of the attack is important, because then you can determine about how long you can expect to stay away from others. Anything less than a pandemic should have some semblance of normal society return once the infection rate is no longer growing. Some biological weapons can survive for long periods on clothing and other inanimate objects. They can flourish for long periods in animals and other living matter. Be wary and do not become complacent after an attack, as many biological weapons can show resurgence once people think they are ‘out of the woods.’ Be sure to practice proper hygiene and remind those around you to practice good hygiene as well. If you had any belonging come into direct contact with a biological agent, you would want to use bleach, charcoal, or fire and dispose of it. This would be extremely unlikely unless you were patient zero, or the first person targeted by the attack.